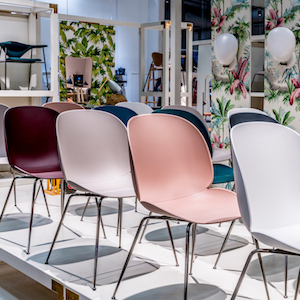 Thanks to its strong aesthetic personality and its excellent comfort, the Beetle chair – designed by the duo of dano-Italian designer GamFratesi in 2013 – is one of the biggest commercial successes of Gubi. Available in a fully upholstered version only at first, it is now available in a polypropylene version, more affordable. Available in 7 shell colours and 3 base finishes, a fixed seat cushion or an upholstered front can be added. Thanks to the wide range of fabrics and leathers offered, it is very widely customisable.